Join award-winning multimedia artist Tianli Zu as she makes papercuts in the Australia-China Institute for Art and Culture. Experiment with traditional Chinese papercutting techniques using scissors. In this workshop, Dr Tianli Zu will explain the meanings of the symbolic patterns and take you through folding and cutting step-by-step while guiding you on how to consider positive and negative space simultaneously. Use your experience as inspiration to create your own masterpiece ready to take home. Tianli seeks to challenge and entertain ideas of both the traditional and contemporary. No previous papercutting experience is necessary (not suitable for small children). FREE. Registration Essential. Please RSVP HERE (opens in a new window) by 18 October. 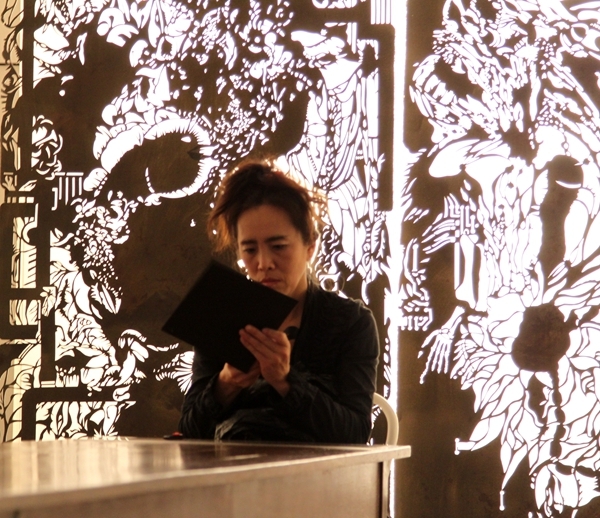 Australian award-winning multimedia artist Tianli Zu was born in Beijing, China. Between 1984 and 1987, Tianli went to Shaanxi province and learnt paper-cutting from folk artists. While cutting she listened to folklore and stories that were embedded with Chinese tradition and culture, in particular Taoist philosophy. Over the years, Dr Zu developed new motifs and utilised them as metaphors, not only carrying on the Chinese tradition, but also extending it to comment on contemporary phenomena. She creates large-scale papercuts by hand and uses cinematic animation projections that weave through history and the present, using shadow and light in powerful dynamic installations. Her work captures experiences of places and cultures through intuitive and metaphysical means. She employs art to engage and comment on complex social phenomena, culturally, philosophically and psychologically. For more information about the artist, please visit: www.tianlizu.com (opens in a new window).